Finally, right?! It’s been almost a month since I’ve ran this race and I am FINALLY getting around to write a recap about it. I think the main reason that it hasn’t been a priority was because it wasn’t a super great race for me. Don’t get me wrong, there were definitely some AWESOME things about it: 1. My parents, hubby, and mother-in-law all came out to spectate the race, 2. 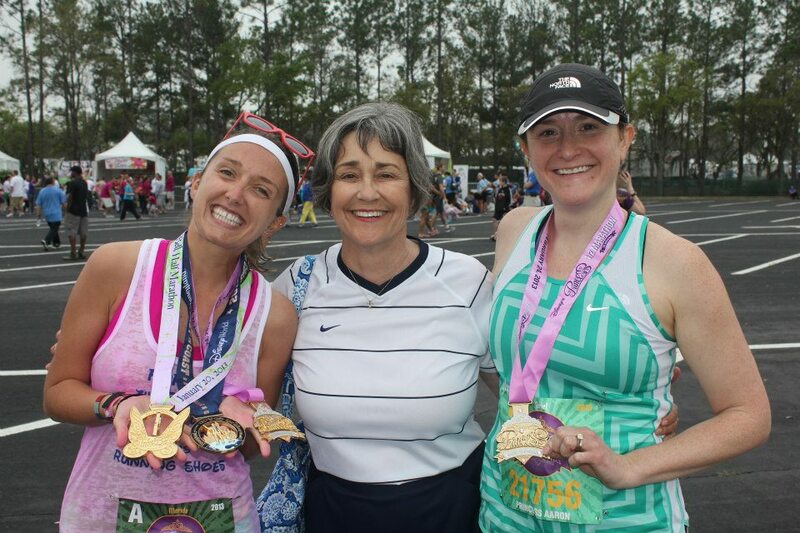 My sister-in-law ran it with me (we were going to run together, but she had bronchitis and wanted me to be able to run ‘my’ race, so she stuck with a run-walk method while I tried to cruise to the finish line), 3. 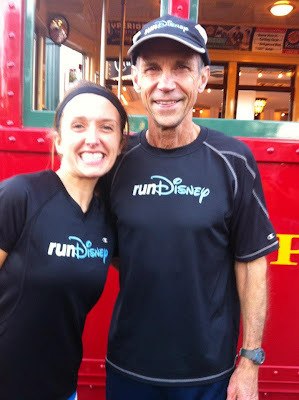 I was on the second leg of my Coast-to-Coast Challenge (running a half marathon at both Disneyland and Walt Disney World in the same calendar year), 4.This was the first time I had been to WDW in 20+ years, 5. 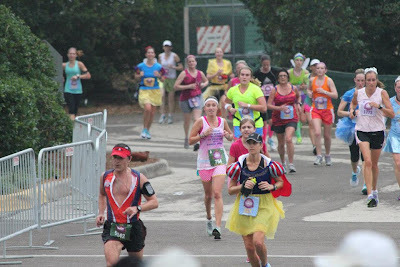 IT IS A DISNEY RACE, I MEAN WHAT CAN BE BETTER THAN THAT?! I went in with a goal in mind. I wanted to shoot for a 1:58 finish time. 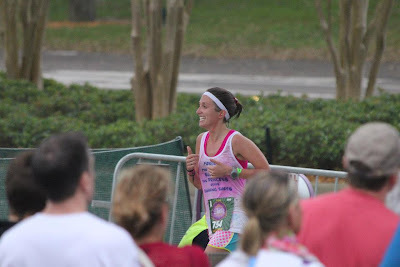 During the Tinkerbell Half Marathon in January I was aiming for a 2:05 – 2:10 finish time and I ended up getting a 1:59”53 (yep, breaking 2 hours by 7 seconds). I thought if I went in with the mindset that I wanted to break 2 hours that I might be able to break it by a little more wiggle room (9 minute mile pace would get me to the finish line right around 1:58, so that is what I was planning on shooting for). 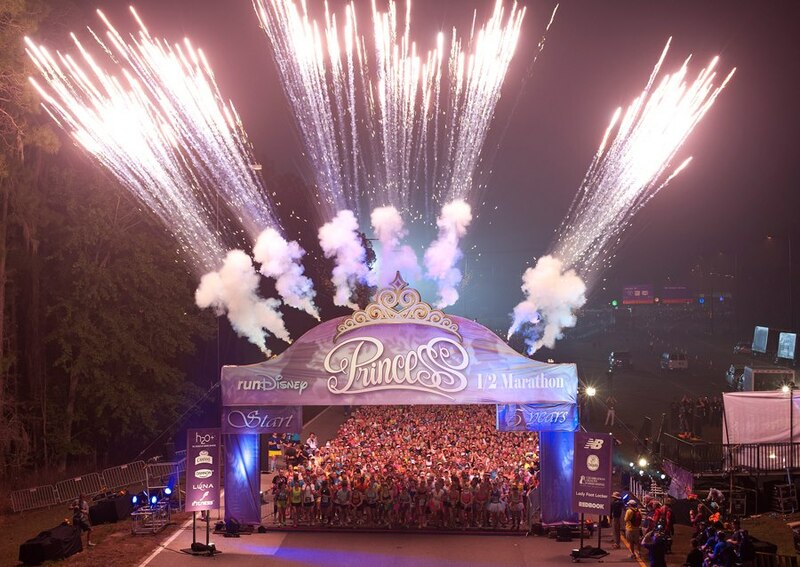 I was actually able to talk my parents and husband into all running the Royal Family 5K the morning before the Princess Half Marathon. I figured it would be an awesome experience (it was my mom’s first race, my dad’s second) and a memory to last a lifetime. I was DEFINITELY right! We had a great time! [[Make sure to check out the recap here if you haven’t read it yet]] I decided I would use it as a warm-up run. 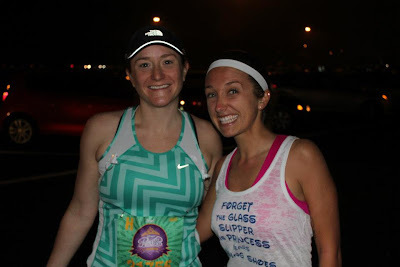 We were going at a casual pace compared to my half marathon pace, which was great since I wanted fresh legs for the following morning’s 13.1-mile run. The one thing I QUICKLY realized was that I was NOT ready or prepared for the weather. I have been doing my training in Southern California – where even in the winter I think it is still 50* and sunny for the most part. The Florida weather for the race weekend was HOT AND HUMID! I was NOT expecting it to be 95% humidity in February (I know that the Marathon Weekend was terrible too, I guess I figured we might get lucky and get ‘normal’ Florida weather). Once I finished the 5K I texted Megan and told her that my goal for the next morning was out the window. I knew with the humidity that I would NOT be able to hit my 1:58 time that I was originally going for. I was slightly bummed, but realized that I didn’t want to hurt myself and would rather finish with a smile on my face. My alarm went off at 2:45am EST (remember Thursday night we took the red-eye, so I didn’t sleep Thursday night, Saturday morning we woke up around 4:30am for the 5K – so I am going on pretty limited sleep at this point) which was a 11:45PM wake up call for the time zone we live in – WOWSER! (Yes, my family all kept reminding me how much they loved me because they were willing to get up this early to stand around and watch me run by them :) ). I got ready, ate a banana, and we headed out the door to go meet up with my sister-in-law and mother-in-law. 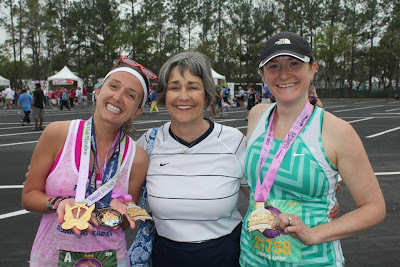 We wanted to give ourselves plenty of time, not only because there were 21,000+ runners, but also because we were meeting up with and leading the caravan with my mother-in-law and sister-in-law. We got to the start with plenty of time to spare. We stood around in the family meeting area for a while, watched all the folks come in with their costumes, etc. After a little bit they made the announcement that runners in corral A should start making their way to the starting line. Megan had mentioned that the startling like was a trek from the family area, but I guess I didn’t realize it was such a walk. I think it took us a good 20-30 minutes to walk over to the corrals. There were plenty of port-o-potties on the walk over to the corrals, just in case you needed to make a pitstop. I was in my corral probably about 35 minutes before the start of the race. 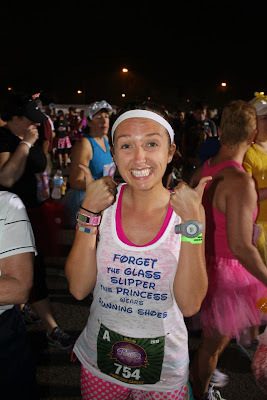 I did a little stretching (still not too sure how I feel about stretching before races – I have heard different things, some research even saying that stretching before races makes you SLOWER) and just tried to relax a bit before the Fairy Godmother sent us off. 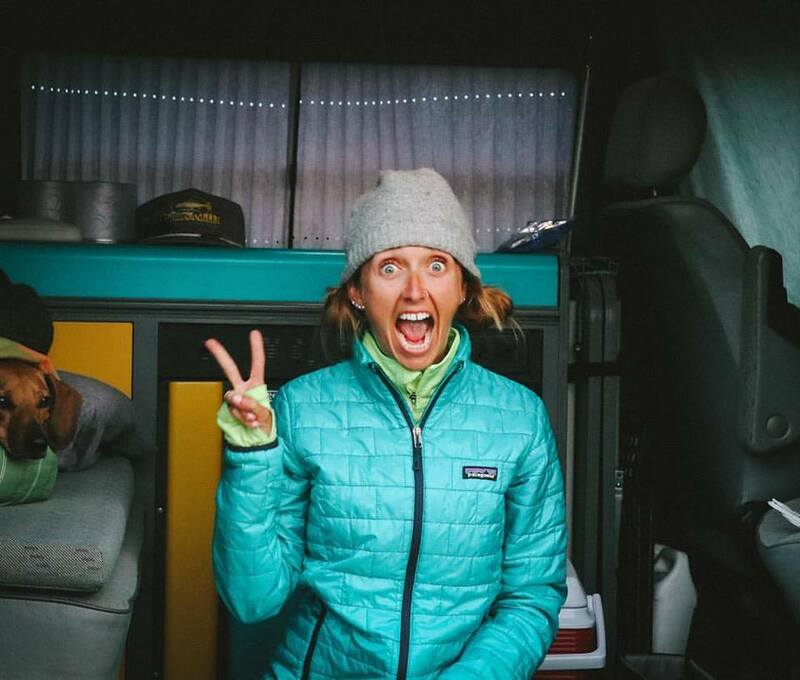 Megan had sent me a brief ‘walk through’ of the course the week before, so I was pretty ready for the course and what to expect along the way. Obviously what I was NOT ready for was the humidity! We were ALL drenched with sweat within the first half mile. By the first water stop I was already taking one cup to sip on and one cup to pour over my head (and I have NEVER had to do this in a race before, let alone at the FIRST water stop about a mile into the race). I knew it was going to be a long race, but wanted to still give it my all. 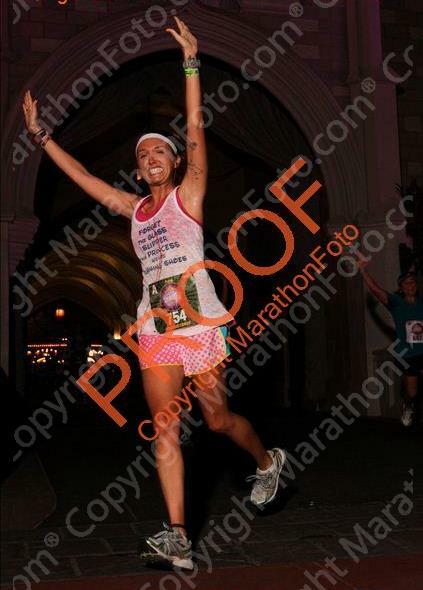 Since I was in Corral A it was dark for most of the race. There were quite a few characters along the course, not to mention performers and other distractions (which is great to keep your mind off of pounding the pavement the whole time). I even had a little God moment along the way. I have Disney music in my running mix on my iPod. I was running up to a character and noticed that it was Genie from Aladdin. At that exact time the song A Friend Like Me (sang by GENIE) came on my iPod. I just had to chuckle and thank God for keeping me on my toes and for the little shout-out (because there are no coincidences, right?!). Anyway, back to the race, when I mentioned to Megan that my time goal was probably out the window due to the humidity and not have trained for it or been prepared to run in it, she suggested that I just have fun and even stop for some character pictures. 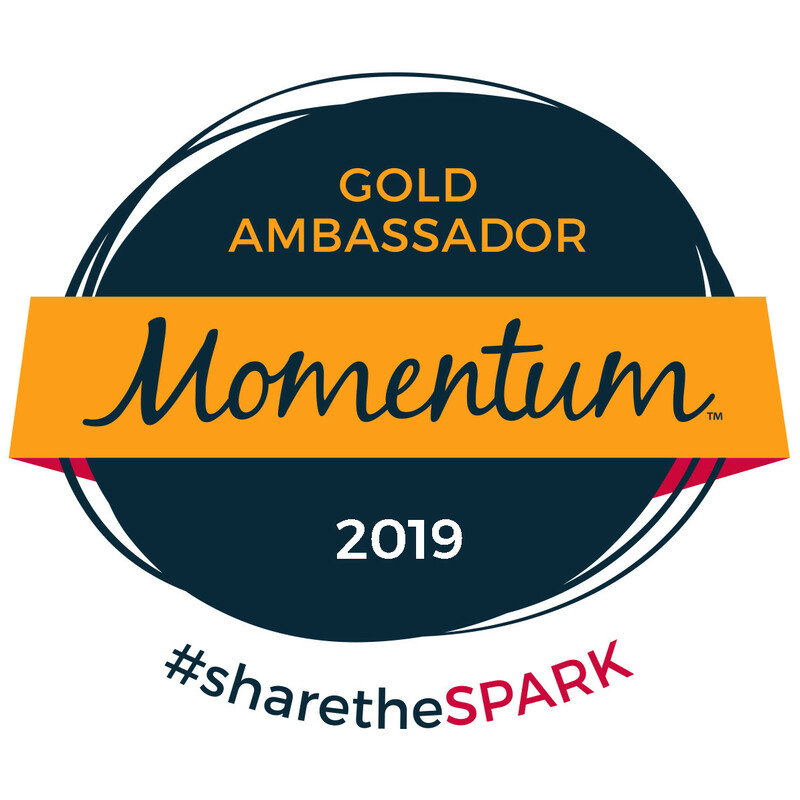 There were a few stops that I actually thought about stopping, but the competitor in me (even if I am just competing against myself and the clock) wouldn’t let me – maybe next time :). On the plane ride to Orlando Thursday night, there were quite a few ladies going to the race (you could tell by all their Disney and running gear). When we were getting ready to board I overheard some of the conversations. One of the ladies had done the race before and a couple of the other ones hadn’t. The runners that hadn’t done the race before asked the ‘veteran’ if she had any suggestions or tips about the course. 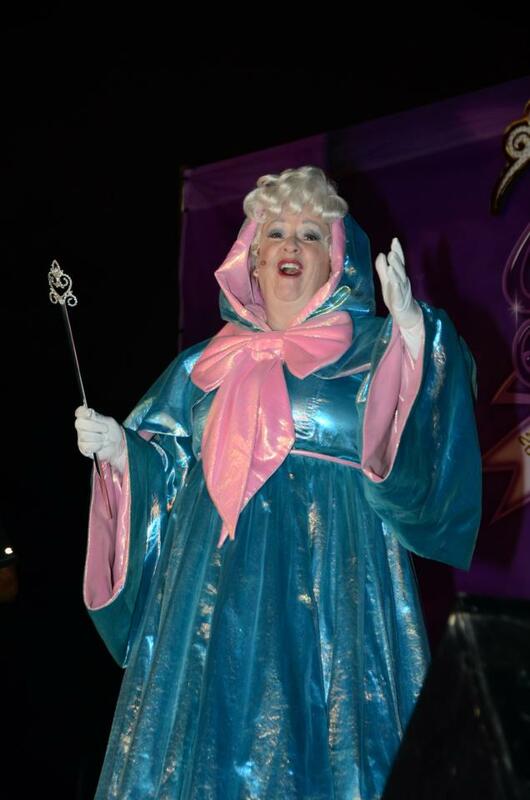 She said that there is a sign for the Magic Kingdom along the route, but you still have a couple miles before you get there, so don’t think that you are half done already. I thought back on this conversation when we were crossing over the SPEED BUMP (they had soooooo many signs and announcements about the upcoming speed bumps and there was only ONE… I guess better safe than sorry). 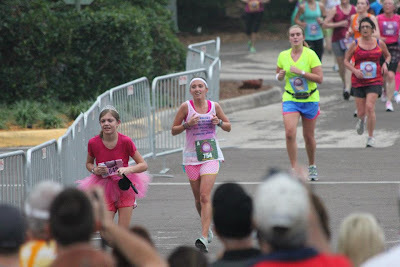 I was just getting ready to think about running through the castle (about the ½ way point of the race I think) until I remembered this conversation and realized we still had a ways to go before being half way done. When we did get to the castle I tried to get a good photo, knowing that the photographers are normally right around there. One of the unfortunate things about being in one of the early corrals (although there aren’t many other drawbacks, hehe) is that it is still dark out for most of the race. 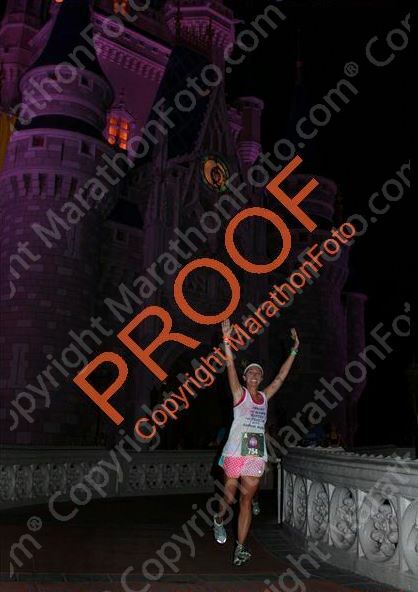 This means most of the pictures are just black in the background and you can’t really tell that you are actually running through the castle (maybe they should somehow set it up so that the light can be shining on the castle and you can actually see it in the picture, rather than looking like you are just running through some random dark hallway). To my surprise, when I was rounding my way past the castle I heard my name being yelled – MY PARENTS AND RYAN MADE IT DOWN TO THE CASTLE TO SEE ME!! I had originally told them that maybe they should stay at the starting/ finish like, that way they could see both Aaron and I start and finish (she was starting in the last corral, which was set to start about an hour after my start, which meant if they went to the castle to watch me they would miss seeing Aaron start). 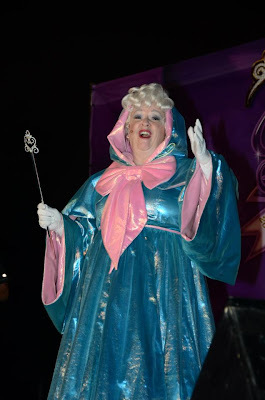 I guess it was difficult to watch the start (especially with the hoards of people), so they decided to hop on the monorail and make it down to the Magic Kingdom to watch me – YAY! What a boost to have your parents and hubby screaming your name while running through Walt Disney World and Cinderella’s Castle! 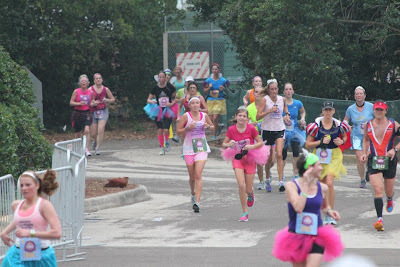 The course back was just about the same as the course down to the Magic Kingdom, just on the other side of the road’s median. More characters, entertainers, displays, etc, but I kept on trekking. I was still keeping a decent pace (around 9 minutes or so for the first half of the race). I was actually thinking that maybe I could still be on track for my goal, but still didn’t want to push it too hard. I had to keep telling myself that there would be more races, and that I didn’t have to hurt myself in hopes of breaking my time. About ¾ of the way through I hit a mini “wall”. The air was just so heavy and I felt like my legs were made of lead. I kept telling myself that the faster I finished the sooner I could be done – but it just wasn’t working. I still ran the whole thing, but I definitely slowed down (I think my pace dropped to close to 9:30 for those last few miles). 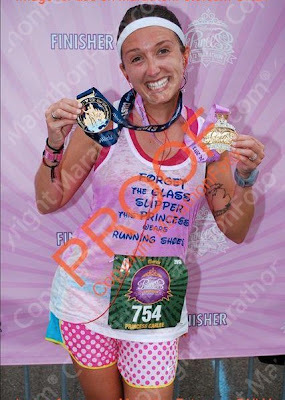 I was drenched by this point – actually I was probably drenched by mile 2 if I am being totally honest (a combination of water over the head, thrown on my legs, arms, back, etc and salty sweat – yumm-o!). 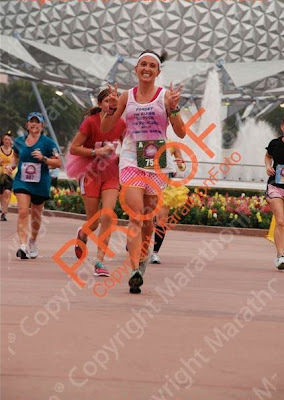 Gotta put your hands up when you cross the finish line, right?! I would say, all in all it was still a successful race. 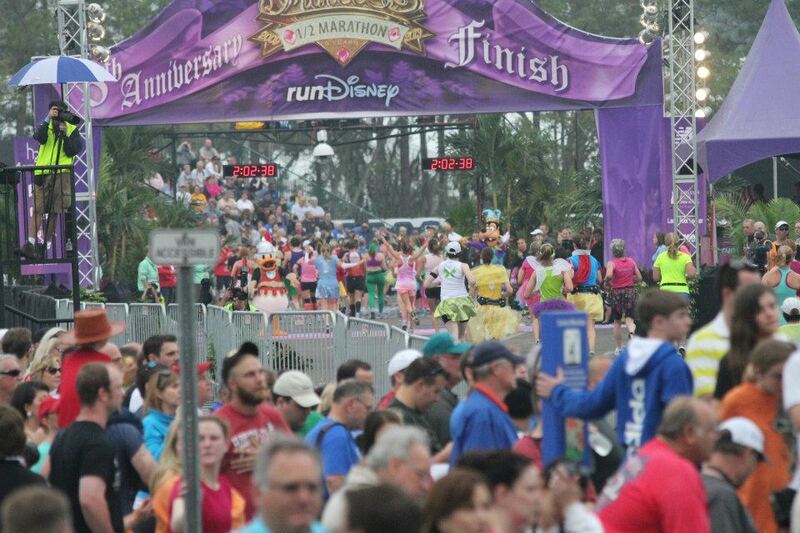 I finished in a time of 2:02:08, which is only two minutes and 15 seconds off from my current PR (personal record). 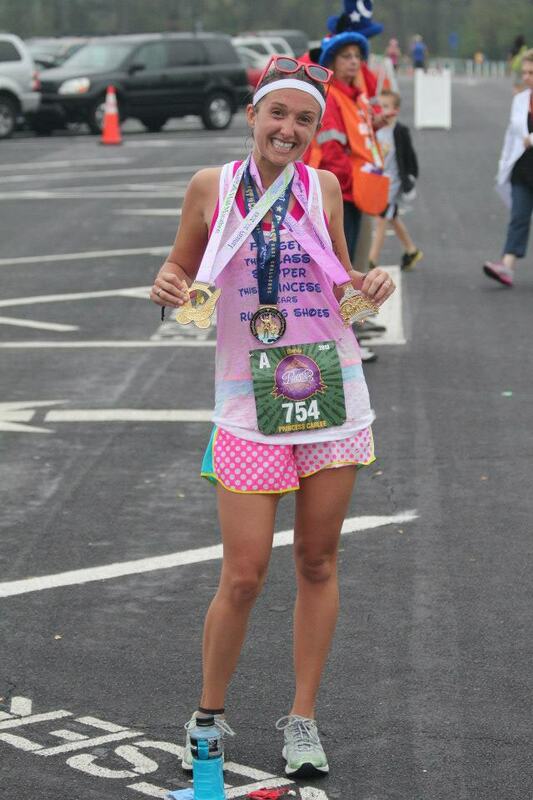 I got my medal and then my Coast-to-Coast medal and met up with my family. We waited and watched my sister-in-law finish which was fun! (I enjoy being a spectator and seeing everyone’s hard work pay off). 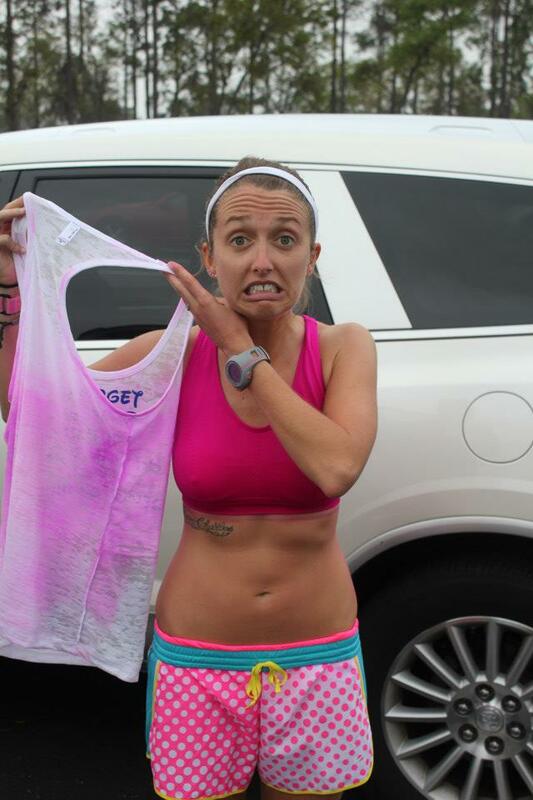 Funny story – although I have washed the sports bra that I was wearing probably 15 times before this race, it still bled its color ALL OVER! 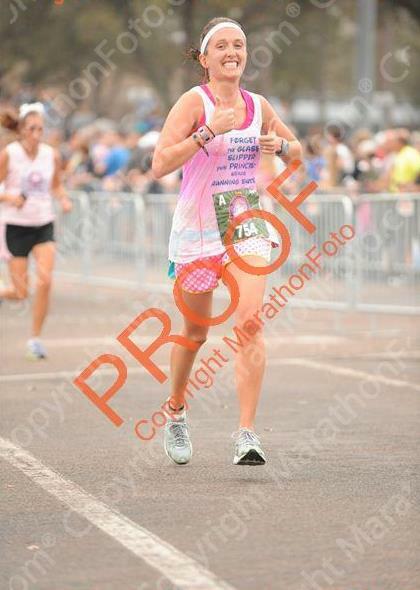 It is funny to look through the professional pictures and see my tank top turn from white to pink throughout the race. When we got back to the condo I threw the tank top in cold water and the color all came out – I just thought it was funny, especially since it dyed my skin bright pink as well. During the race I had already decided I would need to find a half marathon somewhat soon after so that I could run it for time and see how I could do (I haven’t run a non-Disney half marathon yet and wanted to see if I could improve my time at all). 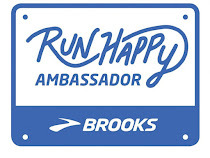 Rock ‘n’ Roll Half Marathon here I come! Omgosh! TOO FUNNY! Can't believe u met Jeff Galloway like that - LOL. Congrats on an awesome race! Ur time was fantastic too despite the hot humidity! 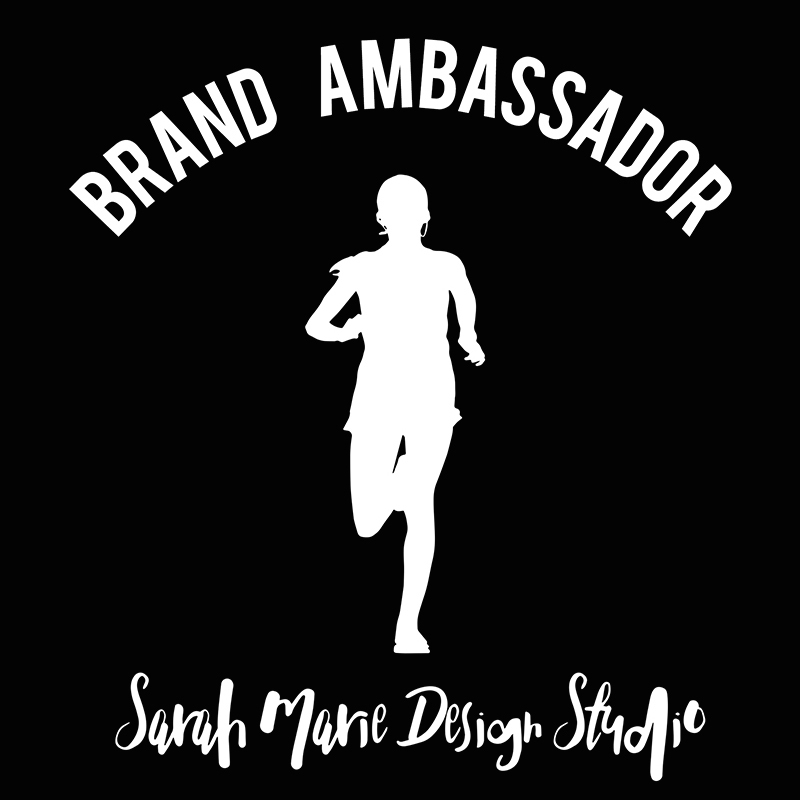 Good luck on your future races! Congrats on a great race!! 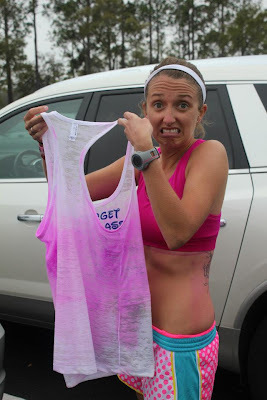 Oh my gosh - that humidity was brutal! !